June 1 Resolves against an "expedition or incursion" into Canada. June 2 Receives Massachusetts proposal to take up civil government. June 7 Resolves to observe July 20 as a Fast Day. June 9 Endorses assumption of civil authority in Massachusetts by the provincial convention. 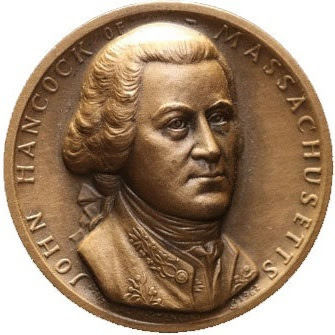 June 10 Resolves to organize a Continental Army. June 15 Appoints George Washington commander in chief of the army. June 22 Resolves to emit $2 million in Continental currency. June 27 Approves invasion of Canada. July 2 Declares independence. July 4 Adopts Declaration of Independence; prepares mobilization for the defense of New York, New Jersey, and Pennsylvania. July 8 Clarifies jurisdictions of northern commanders Gates and Schuyler; augments Washington's discretionary powers and commissary general's authority. July 10 Denounces British treatment of prisoners captured at the Cedars in Canada. July 12 Reads and orders printing of draft articles of confederation. July 17 Adopts "rules and orders for the government of this house." July 18 Reads draft "plan of treaties to be entered into with foreign states." July 19 Orders publication of Lord Howe's commission and correspondence to expose false expectations for a negotiated peace. July 20 Commends commanders of the American victory at Charleston. 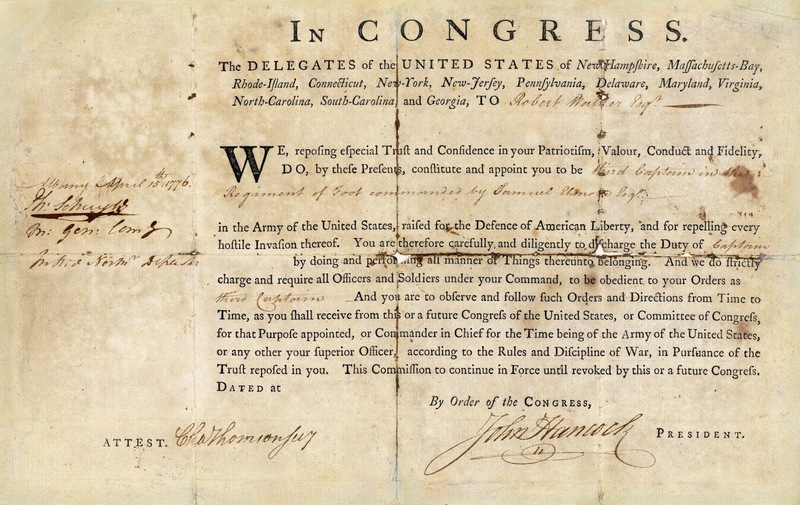 July 22 Adopts procedures for negotiating prisoner exchange; authorizes emission of additional $5 million in bills of credit; opens debate on articles of confederation. July 24 Broadens regulations for confiscating British goods on the high seas. July 26 Orders publication of an account of a conference between General Washington and a representative of Lord Howe. July 30 Recommends southern expedition against Cherokees; adopts sundry resolves in response to report on the miscarriages in Canada. August 2 Delegates sign engrossed Declaration of Independence; Congress authorizes employment of the Stockbridge Indians. August 6 Proposes general prisoner-of-war exchange. August 8 Orders General Lee to return to Philadelphia from Charleston; concludes three-week debate on articles of confederation. August 12 Holds inquiry into conduct of Commodore Esek Hopkins. August 13 Opens debate on revision of articles of war. August 14 Adopts plan for encouraging desertion of foreign mercenaries. August 15 Rebukes Commodore Esek Hopkins. August 16 Censures Commodore Esek Hopkins. August 19 Orders Commodore Hopkins to resume command of Continental fleet; adopts extensive new instructions for Indian commissioners in middle department. August 20 Reads draft Articles of Confederation and orders them printed in preparation for debate in committee of the whole. August 23 Authorizes additional troops on Continental establishment for frontier defense. August 26 Adopts measures for relief of disabled soldiers and seamen. August 27 Resolves to encourage foreign mercenaries to desert from British army. August 30 Adopts plan to improve postal system. September 3 Receives Gen. John Sullivan's written report on Lord Howe's proposal for peace conference. September 6 Designates Benjamin Franklin, John Adams, and Edward Rutledge to meet with Lord Howe. September 9 Revises style of Continental commissions, replacing "United Colonies" with "United States." September 11 Committee meets with Lord Howe on Staten Island. September 16 Adopts new plan for a Continental Army of 88 battalions and system of bounties for recruitment of officers and soldiers. September 17 Adopts Plan of Treaties; receives report of the committee appointed to confer with Lord Howe and orders it published. September 20 Adopts Articles of War. September 22 Sends committee to New York "to enquire into the state of the army." September 25 Resolves to send committee to Ticonderoga to improve administration of northern army. September 26 Appoints Silas Deane, Benjamin Franklin, and Thomas Jefferson as commissioners at Paris. September 28 Adopts "letters of credence" for commissioners at Paris and plan for their maintenance. October 1 Appoints Thomas Mifflin as quartermaster general to replace Stephen Moylan; appoints committee to bring in plan for military academy. October 2 Refuses to accept Gen. Philip Schuyler's resignation as commander of northern department. October 3 Resolves to borrow $5 million and establishes system of loan offices to transact the business. October 7 Receives Gen. Charles Lee's personal report on southern department and advances $30,000 indemnity to him for loss of property in England. October 9 Appoints John Morgan and William Shippen, Jr., director of military hospitals "on the east side of Hudson's river" and in New Jersey, respectively. October 14 Accepts the report of the committee on the appeal of the libel case Joshua Wentworth v. the Elizabeth from the maritime court of New Hampshire. October 18 Appoints Thaddeus Kosciuszko colonel of engineers in Continental Army. October 22 Appoints Arthur Lee to replace Jefferson as commissioner at Paris; instructs commissioners to pro cure eight line-of-battle ships in France. October 28 Appoints committee to conduct inquiry into monopolizing and engrossing of military supplies. October 30 Rejects Maryland proposal to substitute money for land as an additional bounty; adopts new formula for division of prize money in Continental Navy. November 2 Resolves to emit additional $5 million. November 6 Resolves to appoint naval board in Philadelphia "to execute the business of the navy, under the direction of the Marine Committee." November 11 Directs Board of War to confer with Pennsylvania Council of Safety on defense of Philadelphia. November 15 Adopts new pay plan for Continental Navy. November 18 Adopts lottery scheme to raise Continental funds. November 20 Resolves to enlarge navy by eight additional ships. November 23 Receives news of evacuation of Fort Lee and British crossing of Hudson River. November 25 Urges Pennsylvania to mobilize militia for six-week emergency. December 1 Holds emergency Sunday session; authorizes General Washington to order troops from east of Hudson River to west side. December 5 Hears address of Indian delegation. December 8 Holds emergency Sunday session. December 11 Proclaims day of fasting and humiliation; instructs General Washington to contradict report that Congress was preparing to adjourn from Philadelphia. December 12 Adjourns to Baltimore; leaves Gen. Israel Putnam to direct defense of Philadelphia. December 20 Reconvenes in Baltimore; inquires into treatment of Gen. Charles Lee since his recent capture by the British. December 21 Appoints George Clymer, Robert Morris, and George Walton an executive committee of Congress at Philadelphia. December 23 Authorizes commissioners at Paris to borrow "two millions sterling," arm six vessels of war, and seek information on Portugal's hostile actions toward American ships. December 26 Appoints committee to prepare plan "for the better conducting the executive business of Congress, by boards composed of persons, not members of Congress." December 27 Confers extraordinary powers on General Washington for six months. December 30 Approves new instructions for American commissioners abroad and votes to send commissioners to "courts of Vienna, Spain, Prussia and the Grand Duke of Tuscany." December 31 Receives General Washington's announcement of his victory over Hessian garrison at Trenton. 1777 - January 1 Appoints Benjamin Franklin commissioner to the Court of Spain. January 3 Directs General Washington to investigate and protest General Howe's treatment of Congressman Richard Stockton and other American prisoners. January 6 Denounces Howe's treatment of Gen. Charles Lee and threatens retaliation against prisoners falling into American hands. January 8 Authorizes posting continental garrisons for the defense of western Virginia and financing Massachusetts' expedition against Fort Cumberland, Nova Scotia. January 9 Dismisses John Morgan, director general of military hospitals, and Samuel Stringer, director of the northern department hospital. January 14 Adopts proposals to bolster Continental money and recommends state taxation to meet state quotas. January 16 Proposes appointment of a commissary for American prisoners held by the British; orders inquiry into British and Hessian depredations in New York and New Jersey. January 18 Orders distribution of authenticated copies of the Declaration of Independence containing the names of signers. January 24 Provides money for holding an Indian treaty at Easton. Pa. January 28 Appoints committee to study the condition of Georgia. January 29 Directs Joseph Trumbull to conduct an inquiry into activities of his deputy commissary Carpenter Wharton. January 30 Creates standing committee on appeals from state admiralty courts. February 1 Orders measures for suppressing insurrection in Worcester and Somerset counties, Maryland. February 5 Orders measures for obtaining troops from the Carolinas; instructs Secret Committee on procuring supplies from France. February 6 Directs measures for the defense of Georgia and for securing the friendship of the southern Indians. February 10 Recommends temporary embargo in response to British naval "infestation" of Chesapeake Bay. February 12 Recommends inoculation of Continental troops for smallpox. February 15 Endorses the substance of the recommendations adopted at the December-January New England Conference and recommends the convening of two similar conferences in the middle and southern states. February 17 Endorses General Schuyler's efforts to retain the friend ship of the Six Nations. February 18 Directs General Washington to conduct inquiry into military abilities of foreign officers. February 19 Elects five major generals. February 21 Rejects General Lee's request for a congressional delegation to meet with him to consider British peace overtures; elects 10 brigadier generals. February 22 Resolves to borrow $13 million in loan office certificates. February 25 Adopts measures to curb desertion. February 26 Raises interest on loan office certificates from 4% to 6%. February 27 Cautions Virginia on expeditions against the Indians: adjourns to Philadelphia, to reconvene on March 5. March 5-11 Fails to attain quorum; on March 11 urges Delaware and New York to dispatch delegates to Congress. March 12 Reconvenes. March 13 Cautions agents abroad against recruiting foreign officers with limited English language skills; appoints committee "to confer with General Gates upon the general state of affairs." March 15 Reprimands General Schuyler for comments "highly derogatory to the honour of Congress." March 17-18 Adjourns for lack of a quorum-only eight states represented. March 19 Appoints committee on applications of foreign officers for military appointments; declines Baron de Kalb's offer of service. 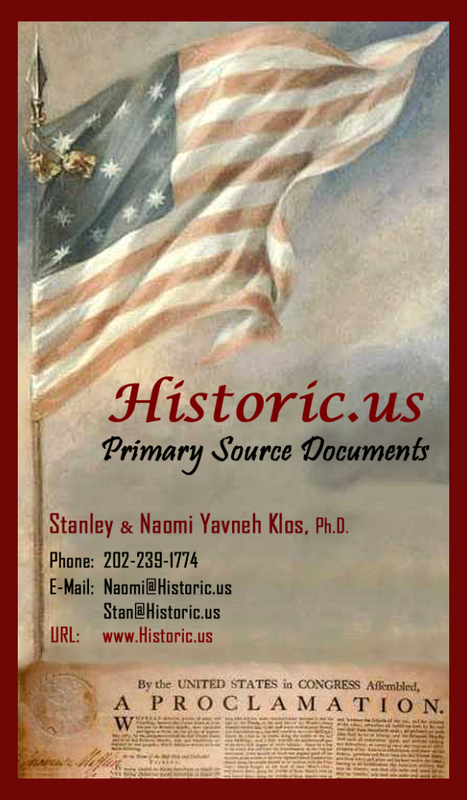 March 21 Appoints committee to confer with Gen. Nathanael Greene. March 22 Establishes and specifies the organization and duties of the office of secretary of Congress. March 24 Informs General Washington that Congress never intended him to feel bound by a majority in a council of war contrary to his own judgment. March 25 Urges Virginia to suspend operations planned against her western Indians; directs General Gates to take command of the army at Fort Ticonderoga; appoints William C. Houston deputy secretary of Congress. March 26 Suspends Esek Hopkins from his command of the Continental Navy. March 29 Reaffirms decision not to send a delegation to confer with General Lee. April 1 Adopts plan for "better regulating the pay of the army." April 4 Adopts commissary reforms recommended by General Greene. April 7 Adopts plan to reorganize the medical department. April 8 Adopts proposals to honor the memory of Generals Joseph Warren and Hugh Mercer. April 10 Orders measures for the defense of the western frontiers and appoints Gen. Edward Hand to the command at Fort Pitt. April 11 Appoints William Shippen, Jr., director general of military hospitals and a new staff of physicians and surgeons general. April 14 Adopts measures to improve recruiting and revises Articles of War. April 16 Urges Rhode Island, Massachusetts, and Connecticut to attack the British forces at Rhode Island. April 18 Resolves to publish report on depredations; appoints committee to conduct inquiry into General Schuyler's command. April 21 Resumes debate on Articles of Confederation. April 22 Orders William Franklin into close confinement in retaliation for his urging Americans to seek royal pardons. April 25 Orders measures for reinforcing and mobilizing General Washington's army. April 29 Orders measures for the defense of Lake Champlain and Ticonderoga. April 30 Appoints committee to evaluate the consequences of the British raid on Danbury; adopts quartermaster and commissary general reforms. May 1 Considers possible hostilities against Portugal; appoints Arthur Lee commissioner to Spain. May 3 Exonerates Gen. Philip Schuyler from charges of misusing public funds. May 5 Debates Articles of Confederation. May 7 Appoints Ralph Izard commissioner to Tuscany. May 9 Appoints William Lee commissioner to Berlin and Vienna. May 14 Debates reorganization of the quartermaster department. May 20 Resolves to emit an additional $5 million. May 22 Appoints Gen. Philip Schuyler to command of the northern department. May 29 Considers draft address to the inhabitants of the United States. June 3 Appoints committee to oversee the defense of Pennsylvania. June 4 Empowers General Washington to offer rewards to encourage British desertions. June 6 Directs Secret Committee and Marine Committee to make an accounting of their proceedings and expenditures. June 10 Reorganizes the commissary department. June 11 Receives committee report on "ways and means for defraying the expence of the current year." June 14 Adopts the United States flag; disciplines Deputy Muster Master Gunning Bedford for issuing a challenge to delegate Jonathan Dickinson Sergeant for remarks made in Congress. June 17 Memorializes Gen. David Wooster for bravery during the defense of Danbury, Conn. June 18 Orders George Morgan to convene an Indian conference at Fort Pitt. June 23 Resumes debate on Articles of Confederation; hears New York complaint against inhabitants of "the New Hampshire Grants." June 30 Rebuffs movement to establish Vermont statehood. July 1 Adopts instructions for commissioners to Vienna, Berlin, and Tuscany. July 3 Adopts instructions for the commissioner to the United Provinces; dispatches troops to suppress Delaware and Maryland loyalists. July 5 Creates Committee of Commerce to replace the Secret Committee. July 7 Condemns Generals Greene, Knox, and Sullivan for an "attempt to influence" Congress. July 11 Appoints committee to proceed to camp "to make a diligent enquiry into the state of the army." July 14 Receives news of the retreat from Ticonderoga and Mount Independence. July 16 Appoints committee to confer with the French officer du Coudray on his "agreement" with Commissioner Silas Deane. July 23 Dismisses 12 naval officers to make an "example" of "combinations of officers to extort increase of pay and allowances." July 25 Appoints committee to study the defense of the southern frontier; commends Colonels Barton and Meigs for "enterprize and valour" in capturing General Prescott and conducting an expedition on Long Island. July 29 Orders an inquiry into the evacuation of Ticonderoga and Mount Independence. July 31 Commissions the marquis de Lafayette a major general. August 1 Begins inquiry into Commissioner Silas Deane's contracts with foreign officers. August 4 Appoints Gen. Horatio Gates to replace Gen. Philip Schuyler as commander of the northern department. August 5 Begins consideration of Committee to Camp report on the "state of the army." August 7 Directs General Washington "to negotiate an exchange of prisoners with the enemy." August 8 Records first roll call vote-on motion to promote Brig. Gen. Benedict Arnold. August 11 Directs implementation of General Washington's proposals for defense of the Delaware. August 15 Agrees to accept parole of prominent Pennsylvania dissidents seeking to avoid exile to Virginia. August 20 Directs mustering of the Pennsylvania militia; dispatches New Jersey militia to New York to relieve troops for frontier defense. August 21 Endorses General Washington's proposal to march his main army toward the Hudson River; receives news of American victory at Bennington, Vt. August 22 Learns of British invasion of the Chesapeake; alerts Washington to the British threat to Philadelphia and issues call for the Pennsylvania, Delaware, Maryland, and Virginia militia. August 26 Requests Pennsylvania and Delaware to apprehend and disarm the "notoriously disaffected" within their states. August 28 Reverses decision to parole prominent Pennsylvania dissidents and orders their removal from the state. September 1 Orders inquiry into the failure of Gen. John Sullivan's expedition against Staten Island. September 4 Orders further call-up of Pennsylvania and New Jersey militia. September 6 Directs clothier general to provide clothing bounties to troops. September 8 Rebukes Silas Deane for exceeding his authority in negotiating agreements with foreign officers in France. Sept ember 9 Orders General Washington to write Congress at least twice daily "advising the position and movements of the armies." September 10 Adopts "ways and means" motion to pay interest accruing on loan office certificates in bills of exchange on the commissioners at Paris. September 11 Learns of the American defeat at Brandywine Creek. September 12 Directs Gen. Israel Putnam to reinforce Washington's army. September 14 Orders General Sullivan's recall until the inquiry ordered into his conduct is completed; resolves to convene in Lancaster, Pa., if the evacuation of Philadelphia becomes necessary. September 15 Orders investigation of a conspiracy rumored to be impending in Pennsylvania. September 16 Grants General Washington broad powers to punish military officers and to impress supplies for the army; orders removal of supplies from Philadelphia September 18 Evacuates Philadelphia. September 19-26 Delegates in flight to Lancaster, Pa. September 27 Convenes at Lancaster; adjourns to York. September 30 Convenes at York. October 1 Resolves to meet twice daily. October 2 Authorizes delegates to draw provisions from Continental commissaries. October 4 Commends sundry officers for bravery in defense against General Burgoyne's northern invasion. October 7 Debates "mode of voting" under draft Articles of Confederation. October 8 Adopts penalties for "communicating" with the enemy; commends Washington for the "brave exertions" of his army at Germantown. October 9-14 Debates taxation proposals under draft Articles of Confederation. October 15 Debates powers of Congress under draft Articles of Confederation. October 17 Reorganizes the Board of War. October 20 Exonerates Gen. John Sullivan for failure of Staten Island expedition; learns informally of General Gates' capture of General Burgoyne's army at Saratoga. October 22 Orders inquiry into the conduct of Indian Commissioner George Morgan. October 23-30 Debates and revises draft Articles of Confederation. October 29 President Hancock takes leave of Congress.